The Church of the Brethren General Offices were designed in 1958 by Frazier, Raftery, Orr, and Fairbank of Geneva, Ill. The building was designed to be beautiful, sturdy, and practical. The structure demonstrates many features of International Style. Steel, glass, and brick make up the bulk of the exterior cladding on the main building, with a high ratio of glass to solid materials. The interior structure contains two enclosed inner courtyards. Of particular note is the stone chapel, which is used weekly for employee chapel services. The architects toured traditional Brethren meetinghouses in the eastern United States to gain a sense of the simplicity that underlies Brethren spirituality. 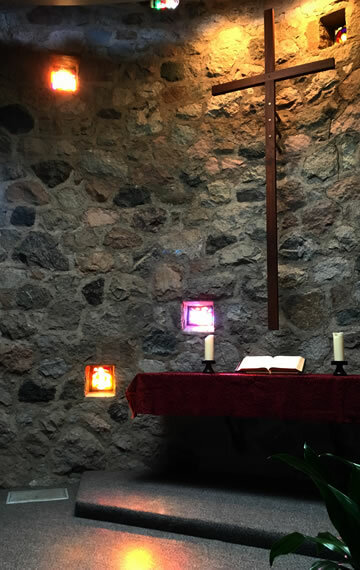 Small stained glass windows punctuate the thick granite fieldstone walls, sending shafts of light across the space in the late afternoon. The entry road and terraces are bordered in the same stone. The oak walls of this classic mid-century building are partitions that can be moved to accommodate different office arrangements. Light enters the building through an abundance of windows and two center courtyards. The architectural feature of bringing the outside in is visible in the front, where the granite fieldstone wall penetrates the stainless steel and glass wall and the Pennsylvania bluestone floor, which begins outside, continues inside the lobby. Most of the furnishings are original. They include sofas by Florence Knoll, cafeteria chairs by Charles and Ray Eames, a pedestal table by Eero Saarinen, benches by Harry Bertoia, and a clock by George Nelson. The building houses staff who lead the worldwide ministries of the Church of the Brethren, a Christian denomination that is more than 300 years old. The church has about a thousand congregations in the US, including Highland Avenue Church of the Brethren on Elgin’s west side. The denomination’s ministries include mission and service projects around the world and resources that support congregations in the US. Among those ministries is Brethren Press, the publishing house that first brought the church headquarters to Elgin, back in 1899. The first building for what was then known as the Brethren Publishing House was located at 22 S. State St. The current offices at 1451 Dundee Ave. were built in 1958 (the 250th anniversary of the denomination) to house the publishing house’s printing presses and the growing administrative offices. While the building no longer holds printing presses, the ministry of publishing continues alongside the other work of the church. The Church of the Brethren bought the land, originally a 52-acre farm, from Ralph A. Hayne. Shortly thereafter the Illinois Northwest Tollway acquired about half the property, leaving about 24 acres for the church’s headquarters of 97,000 square feet. The Church of the Brethren dates back to 1708 in Germany. The church, which draws from both Anabaptist and Pietist traditions, emphasizes peacemaking, simple living, stewardship of all life, discipleship, and service to other people. The Church of the Brethren employs about 75 people, some in other locations. The General Offices also house Brethren Benefit Trust, which employs an additional 20 people. The church rents space to Living Gospel Church of God in Christ.